Before we take a plane or helicopter out to a field site, we have to make sure all the equipment to be installed or replaced at an Automatic Weather Station (AWS) is working and can be deployed quickly. A flight is expensive and the more time spent in the field, the more chance of hitting bad weather, so it is important to be efficient. This means that everything is tested in the lab - where it is warm and we have all the tools we might need. The first picture is of a full AWS (the station we should visit today). 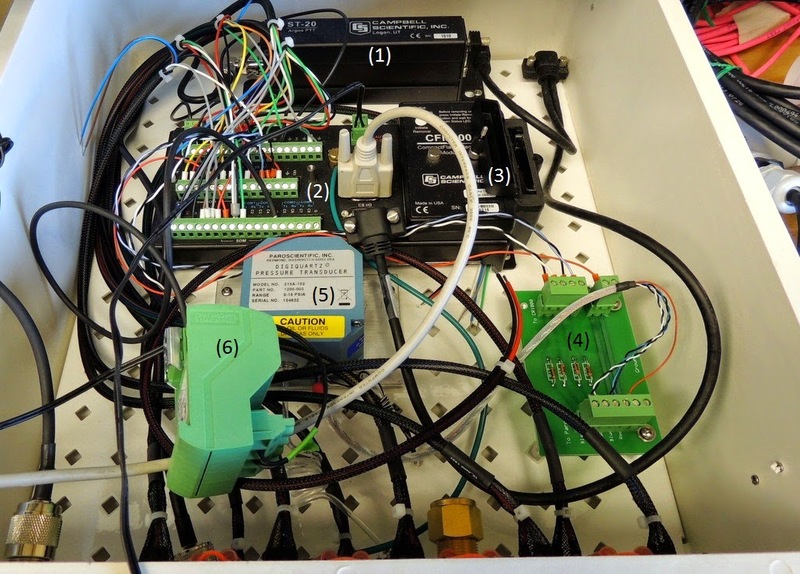 It has various instruments (which I will explain once we have visited a station) and a white box full of electronics- this is the data logger box. 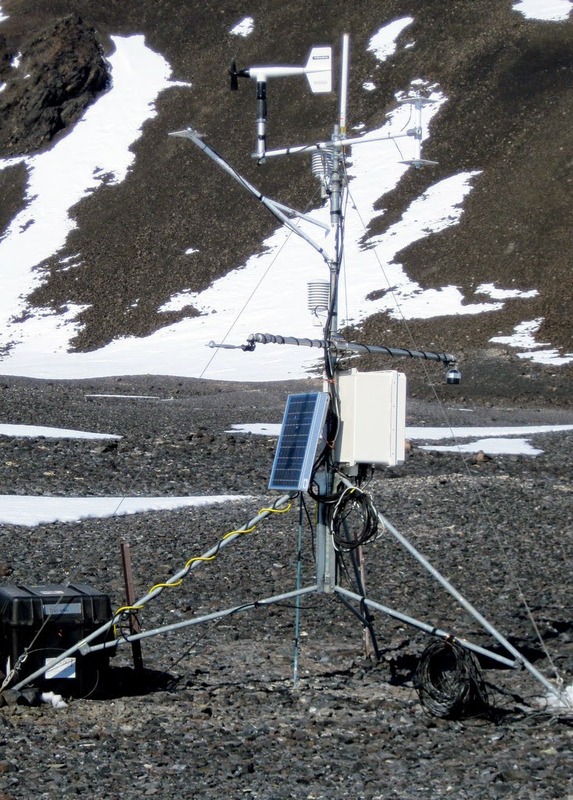 An established AWS showing instruments and a data logger box. The following pictures were taken in the lab yesterday and show some of the pre-field-visit preparation. The data logger box is the control unit of the whole weather station so it is very important that the components inside are ready to operate. The numbered items are listed below. Instrument Controller. Each of the fine wires takes a reading from a weather station instrument such as a thermometer or anemometer (which measures wind speed). Each of the larger black wires at the bottom of the picture go to a different instrument. Batteries provide a continual power source to the weather stations (to run the instruments and transmit the data) so we need to make sure they are full charged before deployment. Solar panels and wind generators at the stations supplement battery power. These are lead-acid batteries; each one weighs 34kg (75lbs). Quiz: If these are 12 volt batteries and are 100 amp-hour capacity, and there are two per station, how much energy is available? For how many hours could you run a 25 Watt light bulb with all this energy? Check that data storage cards have enough free space, and ensure that the correct card goes to its respective station. Instrument Calibration: Is your field instrument measuring correctly? We test field instruments against a known quantity to see if they give the correct readings and adjust the correction factor if necessary (i.e. calibrate it). This instrument produces very accurate levels of pressure (shown in pounds per square inch), so we can test whether the pressure sensor in the data logger box (item #5) is working properly. Make sure all our communication devices are charged and working! Communication with McMurdo Station and various aircraft is vital to maintain safety when working at remote field locations. Here we have two VHF (Very High Frequency) radios sitting in their charging cradles and one satellite phone. VHF radios need line-of-site (and/or repeater stations) to be able to communicate, while the satellite phone works almost everywhere on the planet (but is much more expensive to use). Lee Welhouse soldering connections to a port that plugs into the satellite communications module. The white "pine cone" looking items in the background are radiation shields for temperature sensors - I'll post about these later. One nice aspect of McMurdo is that all the scientists understand how difficult it can be working in Antarctica, so all the groups are happy to provide assistance to each other. The cargo containing one of the communication modules for the AWS project is delayed so Lars Kalnajs of the 2ODIAC project gave us one of his spares and came down to our lab to help get it working.